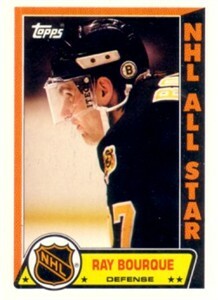 1989-90 Topps All-Star sticker card of legendary Boston Bruins Hall of Famer Ray Bourque (#7). NrMt or better. ONLY ONE AVAILABLE FOR SALE.